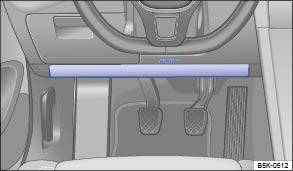 The knee airbag on the driver side is located in the lower part of the dash panel . The airbag location is identified by the text AIRBAG. The area in the red frame is covered by the knee airbag when triggered (deployment zone). For this reason, you must never leave or attach any items in this area. Once triggered, the airbag inflates at high speed. The knee airbag is deployed in the area in front of the driver's knees. Always leave the knee airbag's deployment zone clear. Never secure any items on the cover or in the deployment zone of the knee airbag. 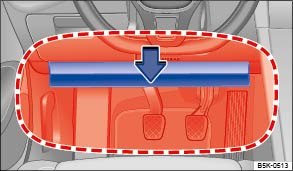 Adjust the driver seat so there is at least 10 cm between the knees and location of the knee airbag. Contact a qualified workshop if your physical build makes this impracticable.